We have all tried to drink warm beers and still thirst for new ones, because they weren't cold enough. 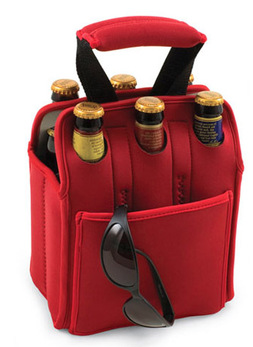 The internet based company Aliexpress.com do now sell 6-pack beer coolers, in addition to help a lot of people to enjoy cold beers, anytime. The beer cooler is handy and can easily be carried around everywhere, which gives your company a good chance to show its logo. This kind of promotional product is also a cheap way of creating brand awareness and should therefore be considered as a part the company's marketing strategy. How can you brand this beer cooler? You company logo/name can easily be printed on, everywhere around this beer cooler. This means that it would be a great way to increase your brand awareness, if you are offering this one for a giveaway. You could also choose to hand this one out at larger music events, which would be quit relevant, as beers is a part of the music. As another option, you could promote your brand by dealing this promotional product around at beaches, where a cold beer or drink could be useful. Above are great examples of how your company can benefit from using a beer cooler, as a part of the marketing strategy. It will gain more attention to your brand, and thereby boost sales.